The advent of big data (whether you buy all the terminology classifications that now fall under this ever-broadening term) has brought with it a widened channel for open source data management tools to flourish. Open source management tools (and by that term “management” we mean application deployment and release management functions, higher level automation controls and/or data and processing orchestration tasks) in this regard include names like Salt, Chef, OpenQRM, Puppet, Ansible, SmartFrog, Juju, and CFEngine to name just eight. 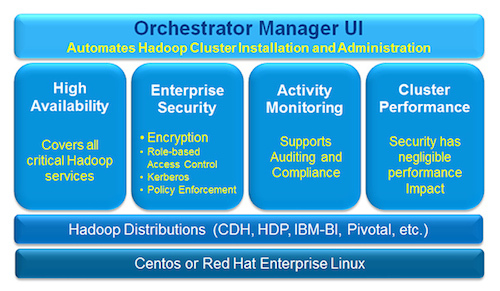 The term management is widening further still; Zettaset has just announced the addition of a Business Intelligence (BI) connector to its logically-named ‘Orchestrator’ solution for enterprise-class Hadoop. What big data should be called? …. or, even, big open managed data with attached analytics fucntions such as Business Intelligence — although that is one hell of a mouthful. No sooner did we say that word analytics and Zettaset snaps on interoperability with the MicroStrategy Analytics platform (it’s “world class” you know? it says it on the website). So what is Zettaset cooking up then? Dive in and indulge yourself in industry terminology for a moment and enjoy the feeling of… a multi-service secure high-availability Hadoop database information-driven application ecosystem. CEO of Zettaset Jim Vogt is positively out of his seat about this stuff. “Our Orchestrator BI Connector not only makes it easier for BI and analytics applications to access the power of Hadoop, it also makes it much safer — we expect this breakthrough will significantly accelerate Hadoop deployments in 2014,” he said. Inside the engine room, this product features KMIP-compliant AES-256 data-at-rest encryption with an “intuitive” UI as well as a command line interface (CLI) user flexibility. Zettaset also says that it can simplify application integration using industry-standard ODBC and JDBC connectors to streamline the interface between the Hadoop database and BI / analytics applications. … and the “learning(s) to take away here? The trend for open source originated data automation and orchestration is massively strong and if you are an industry watcher at any level, then this disk is now well and truly on the menu.